The Business of Design is a series of profiles of business leaders in the design world, brought to you by Roll. We talk to owners and managers of design businesses to take a look behind the scenes and find out what it’s like to run a creative business – the challenges and opportunities, the joys and frustrations and the big wins. Today we talk to Rob Holloway from Auckland branding agency Angle. Rob and his team help clients in New Zealand, Europe and Australia to grow successful brands by making them stand out, solving problems, building customer loyalty and driving results. Roll: Tell us a bit about your background and how you got interested in design and branding. I gravitated towards an arts career from an early age. I did well academically at school but after finishing high school I was uncertain exactly what I wanted to do work-wise. That was until I enrolled in a one-year Foundation Course in Art & Design at Preston Polytechnic (now the University of Central Lancashire) and found my calling. During the course I experienced a number of different creative options: 3D Design, Fine Art, Print Design and in my final term, Graphic Design, which really grabbed me and inspired me to apply for the four-year Graphic Design Degree at the same university. Preston Polytechnic had the best reputation for graphic design in the UK and my course included a six-months industry placement and some excellent tutors. So that really set me up well for a career in graphic design. Roll: Sounds like a great basis for a very successful career. So that was obviously all back in the UK. When did you first come to New Zealand? After graduating in 1991, I worked in the UK for a few years – partly in the north of England and partly in London. In 1997 my future wife and I moved to Auckland and I started working at DesignWorks. Roll: And you’ve been here ever since? No, actually we haven’t. In March 1999 we returned to live and work in London. I spent four years working at The Partners, one of the UK’s most respected and awarded branding agencies. They were the number one creative agency at the time. It was the birth of our first child that prompted us to come back to New Zealand in 2003 to live here permanently and I became the Creative Director Associate at Maxim. Roll: That’s a very impressive list of companies you’ve worked for over the years. When did you first think about starting your own business? In 2009 I had been with Maxim for 6 years and felt it might be time for a change. So I left the agency and decided to do some contract work for a while. At that point I was operating as ‘Rob Holloway Limited’ and a 14-month stint with DNA Auckland occupied me for four days a week so there wasn’t really a lot of time left to do other things. But I did use the spare day each week to work in the background to set up my current business Angle Limited, which I officially launched in 2011. And I’ve been Angle’s owner and Creative Director ever since. Roll: What were the drivers behind the decision to stop working for others and go out on your own? Between June 1989 (my first design agency work experience) and 2009 I’ve worked at 15 different branding and design agencies. I gained valuable experience from each one – good and bad. It just got to the point where I felt the timing was right to do my own thing. So in 2009 I decided to become a business owner and build my own agency. Roll: It’s been 6 years now since you started working on Angle. How has the business grown and developed since then? Angle has grown steadily since 2009. The revenue has grown year on year but more importantly, the number of loyal clients has also increased. While we’ve remained true to Angle’s core skill (branding) we now also apply our skills to multiple other areas. Roll: You must be pretty busy then. Tell us a bit more about how you operate as a business to make sure you meet – and exceed – your clients’ expectations? The business model hasn’t changed over time – I set out to create a full service agency with an associate business model. That means we have no full-time employees but we do have a loyal, all-senior, skilled team of associates. That gives us the flexibility and expertise to tackle everything from small to large projects. Roll: Flexibility is great. But it sounds like such a business model could also come with it’s own challenges – especially around communications and collaboration. How do you manage that? I manage the business, the team and all projects. Life can get very busy but it’s a really rewarding way to work. My leadership style is informal but professional (I hope). I love to communicate… I follow up when I say I’m going to and I stay in touch with the team when working on projects together. Sometimes we physically work together, sometimes we don’t. When we don’t work in the same location, timely communication becomes even more important. Roll: Sounds like you’ve got a pretty good handle on things. But I’m sure there have also been some challenges along the way? Yes, absolutely. Getting clients when starting a new business from nothing was an interesting challenge. I started Angle without any live projects. Building a good name and a reputation happens over time, so my approach was to get my head down, show off what Angle could do and use great project work to help win more business. Today the biggest challenge is staying on top of all the different roles I play in the business. From business development and hands-on design, to billings, presentations, administration and promoting ourselves. As a solo business owner you’re responsible for everything in the business, which is really interesting but can also be very challenging at times. Roll: Do you think there are any specific challenges for creative businesses in general? Creativity is such a personal skill. Harnessing creativity to make a successful business that’s profitable is one challenge. But I strongly believe that a successful branding agency needs a mix of intellect and creativity. It’s not just a pictures business – brands need to be developed in a strategically sound way and then have world class design applied, so that they stand out. Another challenge which crops up from time to time is explaining the benefits of what we offer. Some businesses get it straight away but some don’t. We are not in the business of selling our hourly rate. We create value for businesses and brands. Some people just want to know what a job will cost but we always try to express the value of it in the long-term. And then there’s also the age-old issue of being creative within a budget and on time. Roll: Yes, I think the budget and time challenges apply to many of us, not just creative businesses. But it seems like you and your team have been doing a great job at navigating all these challenges so far and have created a really successful business. Are there any achievements you are particularly proud of? For me, pride comes from working with clients to help them grow successful brands by solving problems, helping them stand out, building customer loyalty & driving results. Some individual projects stand out more than others but usually it’s the problem solving and the ideas generation that creates the biggest sense of achievement. Roll: Having worked in the creative industry for many years now with a number of different businesses, what do you think defines a successful creative business? A successful creative business can be all sorts of things. Anything from a small one-person business to a large, multi-location business. I’ve worked in both these situations and many in between. Bricks and mortar don’t make the difference – a successful creative business is built on the quality of its people, culture and creative leadership. In my view, an attitude and a culture that promotes the value of ideas and creative problem solving is the way to go. Roll: What about successful people? I’m sure you’ve met many inspiring creative people over the years. Are there any role models that stand out in particular? Yes, I’ve worked with many, many talented people over the past 25 years – university tutors, friends at university, peers, and past employers. I don’t want to mention just one person that stands out in particular because there are so many to mention. But the common factor among all the people I admire most is their passion for ideas. Roll: What are some of the key things you’ve learned from your years of running a creative business? Be open, be honest, don’t take things too personally. Communicate clearly at all stages and stay passionate about what you do. Roll: Many young creative people dream about running their own business one day. What advice would you give someone who’s just starting our as a creative business owner? Always back yourself, be confident and try to understand things from a business point of view as well as a creative one. Roll: I think that’s great advice. Now let’s finish things with a bit of a left field question. If you had a magic wand and could fix / change / improve one thing in your business, what would it be? 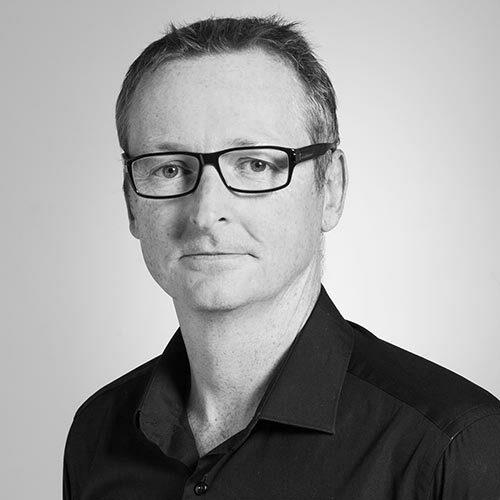 Rob Holloway is the Owner & Creative Director of full service Auckland branding agency, Angle Limited. Angle has clients in NZ, Europe & Australia. Our point of difference is our ability to create a point of difference for our customers. We help people grow successful brands by making them stand out, by solving problems, building customer loyalty and driving results. If you’d like to talk to a branding expert contact us here. Read Rob Holloway’s LinkedIn profile here. Follow Auckland branding agency Angle Limited on LinkedIn here.